After the success of the “J” week jellybean treat, we decided to send in another themed snack to the nursery school class during “D” week. 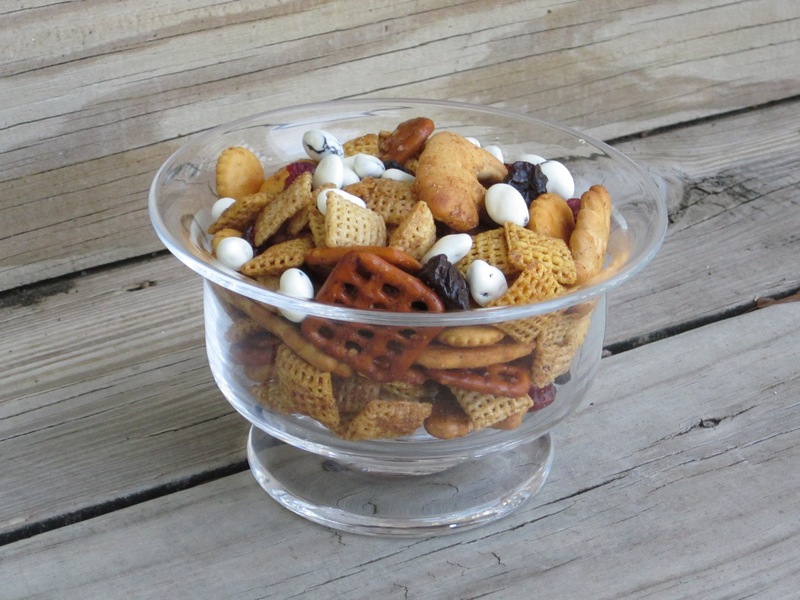 We combined some Chex mix recipes and came up with a dinosaur style snack mix. The idea was to have kids dig for dinosaur bones and dinosaur eggs in the snack mix. Preheat oven to 350 degrees. Spray 13×9 pan with nonstick cooking spray. Place cereals, oyster crackers, pretzels, and graham sticks in a large bowl; mix lightly. Combine butter, sugar, cinnamon, and nutmeg in small bowl; mix well. Drizzle evenly over cereal mixture. Toss to coat. **If the mixture is pretty dry, mix another half batch of butter/sugar/spice and add. Spread the coated cereal mixture in an even layer on the pan. Bake 10 to 12 minutes or until golden brown, stirring gently halfway through. Cool completely. Stir in dried fruit and yogurt-covered raisins. Instead of graham sticks or animal crackers, you could use mini-dinosaur grahams. I can’t ever find these at my grocery store, but I think they are out there. For “G” week, you could make Gorilla Grub and substitute the yogurt-covered raisins and dried fruit for plain raisins and dried banana chips.